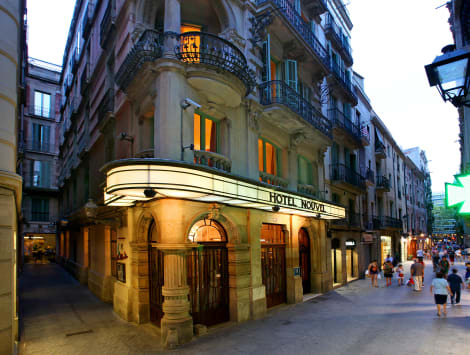 A stay at Hotel Continental Barcelona places you in the heart of Barcelona, steps from La Rambla and Placa de Catalunya. This hotel is 0.3 mi (0.5 km) from Boqueria Market and 0.4 mi (0.6 km) from Barcelona Cathedral. Located in the heart of Barcelona on a quiet pedestrian street. Next to Las Ramblas and Plaza Catalunya. Porta de Angele shopping street is just 2 minutes walk away. Modernist style building with more than 100 years of history. All rooms come with a flat-screen TV, double-glazed windows and private bathroom. Offering air conditioned rooms and free WIFI. The Hotel Nouvel is a classic 3-star hotel, found in the heart of Barcelona, just a few minutes from the Plaça de Catalunya, Gothic District and the luxury boutiques of Paseo de Gracia. For your convenience the hotel has a 24-hour reception and free wi-fi throughout, and you can relax or browse the web in the reading room. Rooms at the Hotel Nouvel are all air-conditioned and have a flat-screen TV and private bathroom. This hotel was built in 1876.